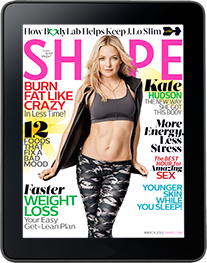 Get the results you’ve always wanted with motivation from Shape’s energy-boosting tips, delicious healthy recipes, step-by-step workouts and more! Digital editions with all the benefits of hassle-free automatic renewal are available on iPad®, select Android® devices, Nook®, the Kindle Fire®, and Next Issue Media™. Available on Android™ devices. Android, Google Play and other marks are trademarks of Google Inc. Available on Android, iPad®, Mac and PC. Zinio is a trademark of Zinio, LLC.